Lindsey Vonn crashes during the FIS World Ski Championships Women's Super G on Tuesday, Feb. 5, 2019, in Are, Sweden. One of the hallmarks of Lindsey Vonn's career has been the way she bounces back from major crashes time and time again. 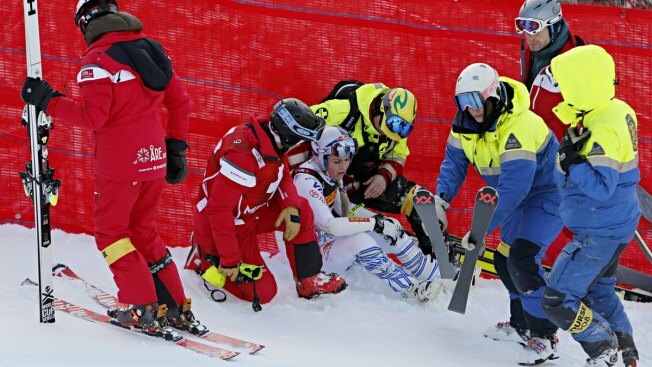 So perhaps it's fitting that the most successful female skier of all time will enter her last race before retiring following yet another tumble into the safety netting. The 34-year-old Vonn, the all-time leader in women's World Cup wins, announced last week that she will retire after racing the super-G and downhill at the worlds — meaning that Sunday's downhill is her final race. Vonn's long history of crashes has included frightful falls at the 2006 Turin Olympics and 2013 worlds. Her legs are so battered that she will have knee surgery for the seventh time soon after she retires — to repair the left knee ligament she tore during training in November. Vonn was planning on retiring in December but moved up her last race upon realizing last month after failing to finish a super-G in Italy that her knees just can't handle anymore pounding. She has discussed the long-term health risks for her body with her doctors. "I'm screwed. I've known that for three years now," Vonn said. "It's only a matter of time. The analogy I was given was, I only have a certain amount of steps left. And I've run out of steps at this point. I know I'll have pain for the rest of my life but I wouldn't change it. ... I got no cartilage, no meniscus, I got rods and plates and screws. There's a lot going on. My head is still good, that's all I need." It didn't take Vonn long to process on why she crashed. When she barreled through a gate, the panel fitted between the two poles detached and got stuck on her boots. When she hit the ground she slid downhill face first, using her hands to keep her head from hitting the snow, then came to a stop in the netting. "My immediate thought was 'What the hell? Why am I in the fence again?' It was like, 'Why am I here? I'm too old for this.'" "That's Lindsey. She (goes) 100 percent or nothing," said Austrian racer Nicole Schmidhofer, who finished 11th. "That's why she has won so many races and why she's an Olympic champion."